'The Richest Sparrow in the World' is a rare and fabulous children's book which teaches children that greed is not good and how friends should look after each other. Common sense wisdom which is often forgotten. At least, Wall Street got the 'last part' right. 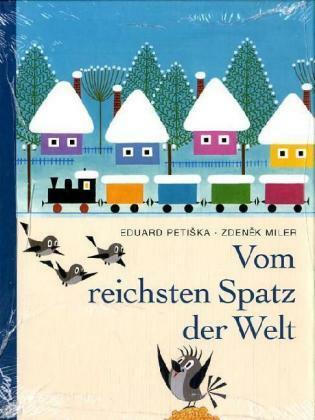 The book was written by Eduard Petiska and the illustrations by Zdeněk Miler are absolutely stunning with a beautiful warmth of various grades of primary colors that you never see these days. The five stories are lovely and timeless. The Richest Sparrow in the World tells the story of friendship and sharing through the eyes of a little sparrow called Rufflehead. This is one of those impossible to find rare children's books with copies being offered over $200 on eBay. There is no need to despair however. If you have an account with Amazon.com: visit the German sister site of Amazon which is http://www.amazon.de. Amazon Germany is happy to ship to the US. So do a search for "Vom reichsten Spatz der Welt" and you will find that the same title is still in publication in Germany (a good chance to brush up on your German perhaps).